These recipes for pizza dough and sauce are very easy to make. The dough rises in 30-45 minutes. 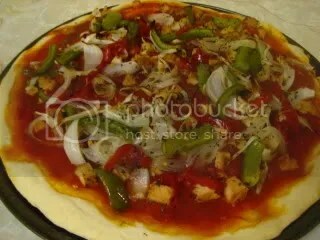 I made the sauce and prepped the toppings while the dough was rising. I’ve been making this easy pizza sauce for years and love it. The dough recipe was one I hadn’t tried before. It was on the back of the Flieschmann’s Active Dry Yeast packet. I had another recipe in mind but when I saw it, it looked so easy that I gave it a shot. I made this while my parents were in town and they loved it. 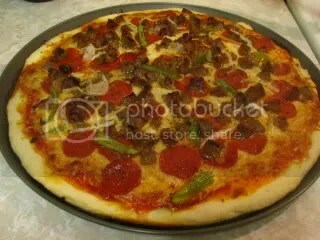 Of course it’s pretty easy to pick up the phone and order a pizza but making a homemade one really isn’t that hard and it’s so worth it. Soften yeast in warm water, in a mixing bowl. Add 2 cups flour, salt, sugar, and oil. Stir in enough remaining flour to make a soft dough. Knead on lightly floured surface until smooth, about 4 to 6 minutes. Place in greased bowl; cover and let rise in a warm place until doubled, about 30 to 45 minutes. Punch dough down. Pat dough into a greased large pizza pan. (Make sure you use a large pan unless you want very thick dough!) Top with desired toppings. Bake at 400 degrees for 20 to 30 minutes. Combine all ingredients and spread on pizza crust. Note: Instead of oregano and basil, sometimes I use 1/2 teaspoon of Italian seasoning and that works very well, too. Your pizza’s look incredible. I love homemade pizza. Your sauce recipe sounds great. I love pizza. I’m going to have to make it again soon.